The prospect of European car sales this year falling to their lowest level since 1995 is not reflected in the Automotive News Europe/PricewaterhouseCoopers Transaction Services Shareholder Value Indices for the third quarter of 2012. 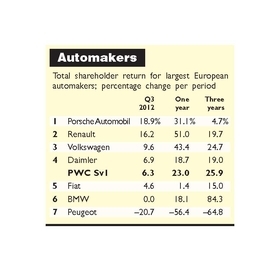 In Q3, European automakers achieved a 6.3 percent rise in shareholder value after a 12.0 percent decline in Q2. Suppliers fared even better, offsetting a 7.7 percent decline in Q2 with a 12.9 percent gain in Q3. Auto retailers, meanwhile, stayed in positive territory for the third consecutive quarter. Dealer groups' 15.3 percent rise in Q3 followed a 35.3 percent first-quarter gain and a 3.7 percent rise in Q2 of this year. A number of factors underlie the apparent paradox between expected unit sales performance and shareholder value. In part it is due to a general stock market buoyancy over the quarter – markets tend to anticipate future earnings rather than reflect current reality. Germany's DAX, for example, rose 12.5 percent over Q3, more than offsetting its 7.6 percent fall in Q2. The European STOXX gained 8.9 percent after a previous-quarter decline of 6.2 percent, and the UK FTSE followed a 1 percent gain in Q2 with a 5.5 percent rise in the third quarter. Even France's CAC – soon to be without PSA/Peugeot-Citroen – recovered from a 3.6 percent fall in Q2 to register a 5.6 percent gain in Q3. In part, the latest rise in shareholder value indices can be attributed to the exposure of some participants, particularly prestige brands, to markets outside Europe, such as the United States and China. But it may also be due to significant volatility between quarters and between individual companies. The latter point was clear to see during the first three quarters of this year. In Q1, every manufacturer posted value gains, ranging from 7.0 percent for Porsche to 47.5 percent for Renault. In Q2 only one carmaker, VW, managed to avoid recording a loss in value. For the remainder, value losses ranged from 9.8 percent for Porsche to 35.8 percent for Peugeot. But in Q3, only Peugeot stayed in negative territory, falling 20.7 percent, while BMW was unchanged. Porsche topped the list of winners, up 18.9 percent, followed by Renault, up 16.2 percent, and VW with a rise of 9.6 percent. The most troubled of Europe's car manufacturers is also its second largest in terms of sales: PSA/Peugeot-Citroen. The French firm has been struggling to cope with a disastrous decline in sales in its key export markets of Italy, Spain, as well as weakness in its domestic market. Heavy losses have forced the company, one of its biggest industrial employers with 100,000 workers, to announce plans to close a plant outside Paris and to shed about 10,000 jobs. More recently, following a hefty collapse in its share price, the firm has been told it will no longer be included in the French index of leading blue-chip companies – having been part of the CAC 40 since it was launched in 1987. The other large French manufacturer, however, has fared much better. Renault's net income in the first half of 2012 was 786 million euros compared with 1.25 billion euros in the same six months of last year. Two significant factors are working in its favor. It has stronger sales outside Europe than PSA, especially in Brazil and Russia. Secondly, Renault's 43 percent stake in Nissan contributed 564 million euros to its H1 net income. In addition to continued strong sales, the star performer in Q3, Porsche, received a boost when a German court dismissed two of four legal actions against it. 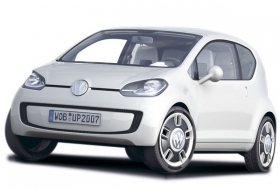 These involve disgruntled shareholders seeking compensation for alleged market manipulation during the company's failed bid to takeover Volkswagen Group in 2008. The Automotive News Europe/PricewaterhouseCoopers Transaction Services Shareholder Value Index for parts suppliers shows a similarly volatile pattern to the carmakers' index. All 20 partsmakers included in the index showed gains in the first quarter, ranging from 10.2 percent to 52.9 percent. In Q2, only two companies managed to stay in positive territory and the other 18 recorded declines ranging from 4.3 percent to 33.8 percent. In Q3, however, 16 out of the 20 recorded gains once again. The best performer was Montupet, the French manufacturer of aluminum cylinder heads, which rose 29.3 percent. 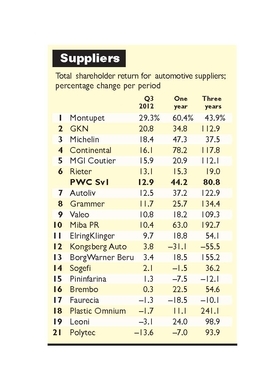 The company has consistently been in the top half of the shareholder value performance table for supplier this year. By focusing on its cylinder head business and disposing of less profitable activities last year Montupet achieved strong profit growth in the first half of 2012. The next best performer was GKN, the general engineering and drivetrain specialist. It reported first-half pretax profits rose 43 percent this year. Its European drivetrain business, which accounts for close to half of its sales, benefited from a close involvement with premium car manufacturers, such as BMW and Mercedes-Benz. The announcement in July of acquisition terms for Volvo Aero, which were less onerous than had been expected, also helped lift GKN's shareholder value. Tire manufacturers Michelin and Continental made gains of 18.4 percent and 16.1 percent, respectively. Michelin, the world's second-largest tire maker, enjoyed a strong operating performance and raised its long-term outlook. In the third quarter Continental, which is headquartered in Hanover, Germany, made a return to its domestic stock market, the DAX, after a 45-month absence. Good first-half growth was partly driven by earnings derived from European automotive sales in North America and China, while balance sheet improvements have resulted in a debt rating upgrade for the company by Moody's Investor Services. Investor sentiment toward both European tire companies has also benefited from speculation that the EU may introduce legislation on winter tires. As these tires cost 25 percent more than their summer counterparts, such Europewide legislation could be worth 2 billion euros in additional revenue to the sector. As in Q1, all but two of the retailers included in the Automotive News Europe/PricewaterhouseCoopers Transaction Services Shareholder Value Index recorded gains in Q3 this year – a position that had been reversed in Q2. Vertu Motors, the UK retail chain based in Birmingham, improved 34.7 percent following continued profit growth and further expansion. The recent acquisition of six sales outlets from The Co-Operative Group Motors in the north of England gives it a network of 88 sales and aftersales outlets across the UK, compared with less than 60 outlets in March 2010. Another UK multi-franchise dealer group, Lookers, recorded a 21.8 percent rise in value. Its performance was lifted by increased demand in the second-hand car market in the first half of the year. 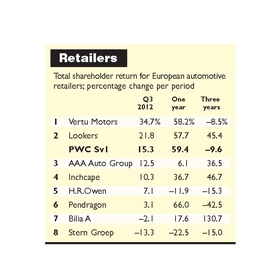 The weakest performer in the retail category was the Netherlands' largest car dealer, Stern Groep NV.